Electronic equipment will always generate some heat and often requires forced air cooling to prevent component damage, extend life of the product and reduce production losses. This is particularly important in motion control systems when used in high ambient temperatures that are common in Australia. 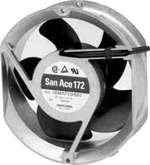 The Sanyo Denki cooling fans have very high reliability and long life with low acoustic noise emission. The quality/price ratio is high and flow rate to size ratio is superior to most other manufacturers. Applications include CNC controls, scientific and medical equipment, power supplies, renewable energy and communications.